I find it hard to dislike anything about this sandwich, I find it hard to dislike anything when avocado is involved. 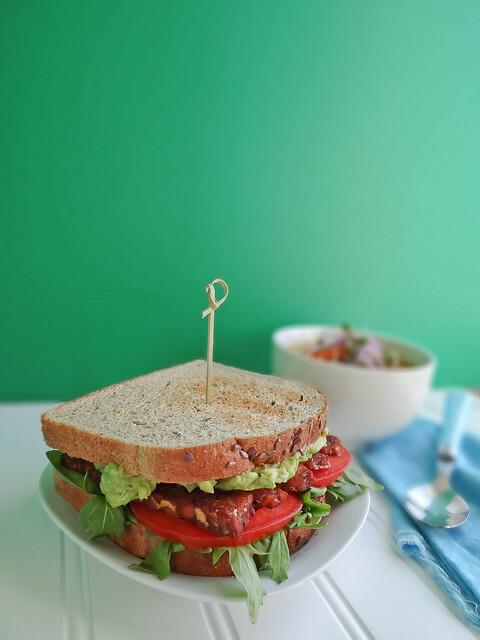 Homemade tempeh bacon is paired with avocado then sandwiched between two slices of toasted bread with spicy arugula & greenhouse tomatoes. 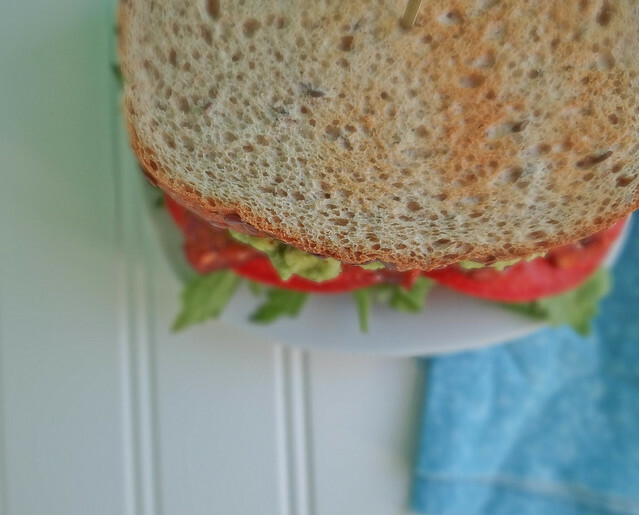 This is a super easy sandwich to make on the fly, it is the sandwich that Justin and I rely on when we are procrastinating about dinner - super easy and always a crowd pleaser, our go to sandwich. Truly this is also the perfect soup sandwich, it also makes a pretty awesome triple decker - but I must admit i haven't had one of those in forever. My Mom use to make us BLT's on busy weeknights - crispy bacon, iceberg lettuce, tons of miracle whip (even though she can't the stuff) and white bread. I like to think of this as a more grown up version of a childhood favorite. Since my success with tempeh sliders I have been cooking with tempeh quite often - over the weekend I tried my hand at homemade tempeh bacon. Super easy and delish! This sandwich is something Justin totally gets behind, however if I would have served this to him a year ago he would have immediately asked where the mayo was and why did I put leafy green things on his sandwich. It has been so awesome to see his taste buds and view of food transform over the past year. We served our BLT's with Cheezy Potato and Broccoli Soup (Monday's post!) which made for an cozy lunch after a day of snowshoeing. Do you cook with tempeh - what are your favorite ways to prepare it? I'm always looking for new ideas! in a shallow dish, mix together the tamari through water. Place strips of tempeh in the dish ensuring all strips are submerge in the marinade. Allow to sit for a minimum of 30 minutes - overnight if possible. In a large frying pan, over medium/high heat place 10 strips of bacon in the pan with 2 tbsp of the marinade. Pan fry until golden brown, flip strips and pour an additional 2 tbsp marinade over the strips and pan fry until golden brown. Store remaining tempeh and marinade in an airtight container in the fridge and use throughout the week as needed. Marinated Tempeh will keep up to 1 1/2 weeks. Toast bread, layer the bottom half with arugula, tomato & 5 strips of tempeh bacon. Spread half of the avocado on the remaining slice of bread and set on top of the tempeh bacon. Repeat steps to make the other sandwich. This looks super amazing! 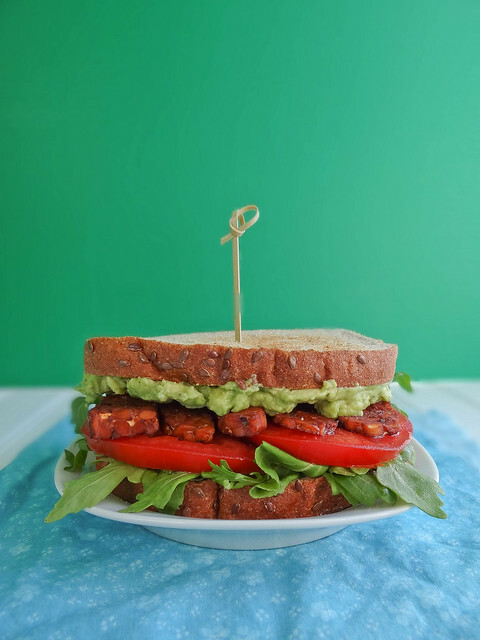 I haven't had tempeh for quite a while, and I think it is time to remedy that ASAP by making this sandwich. wow, no mayo on the blt? now, dayv would never stand with that, he LOVES vegenaise. i'm so happy for your success with winning over justin's tastebuds with new and exciting things. i always loved blt's growing up. i've never experimented with making vegan bacon, and have only made tempeh once. i must experiment with it more! I've only had the pre-made tempeh bacon. Have to admit I wasn't a fan, but I've gotta give it another shot and try it homemade. That looks incredible! what a delicious looking sandwich! 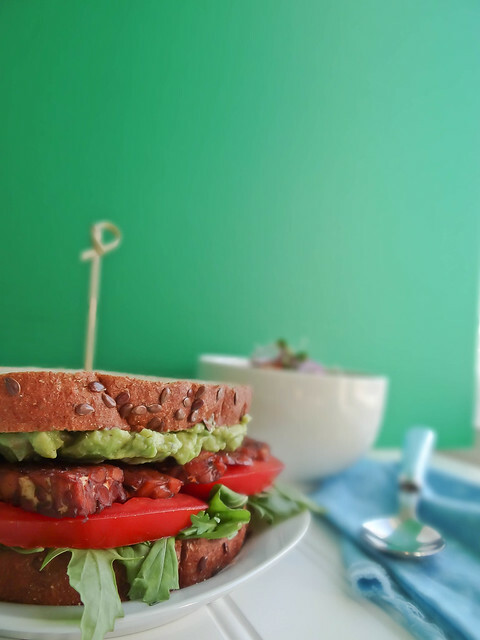 I am looking fowards to trying this tempeh bacon!! Never tried tempeh bacon but I think I just might now! I've been looking for good sandwich ideas to try. I'm getting a bit fed up of shops only offering variants of falafel/hummus/carrot sandwiches as vegan options, everything else has egg or some form of dairy or meet in it. Thanks for the great recipe! Yum yum yum yum yummmm!! I am totally on board with this sandwich. I wish I could eat one right now! i agree.. nothing to dislike in this sandwich!! The homemade tempeh bacon looks incredibile, all I've had is the frozen premade kind with I definitely would not have again. Can't wait to try this instead. I totally agree with what you said about avocado - I don't think I've ever had an avocado-based dish that I haven't liked! I love the vibrant green colour that it adds to your sandwich. I remember those triple decker sandwiches that my parents used to make for us sometimes too - we called them club house sandwiches, but I don't even remember everything that went into them anymore! 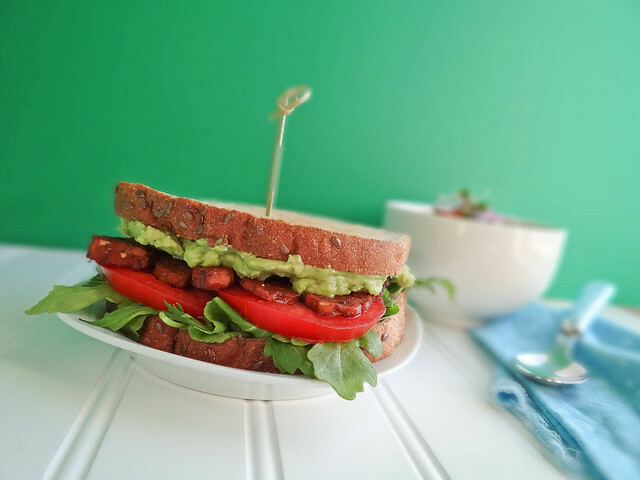 I love cooking with tempeh, but have never used it to make tempeh bacon before... reading this recipe, I suspect I might like this just as much if not more than a classic BLT. The whole sandwich sounds perfect - leafy greens and all! Yummy - this looks amazing Heather! I love tempeh (better than tofu by a mile) - I often eat it in salads or in tacos too. This sandwich looks divine, love that toasted bread! be still me beating heart, this looks amazing! 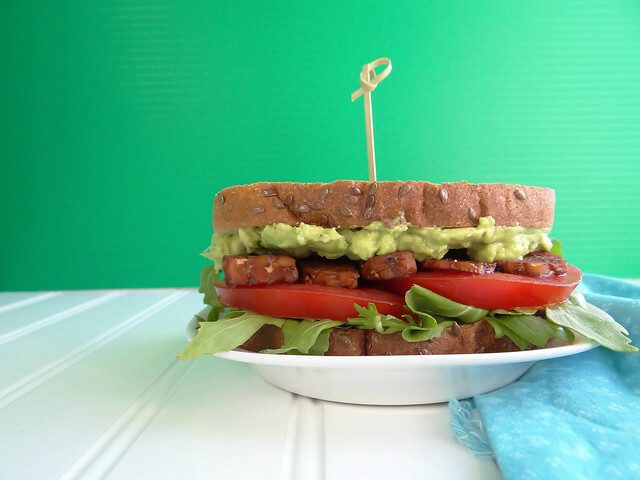 I actually like tempeh bacon a lot more than I liked real bacon and you're right, anything with avocado is amazing!! Loving your recipes lately my dear, they are all so spot on with my moods and cravings! Haven''t had temph before but your triple dekker sandwich looks awesome. I love tempeh and I love how easy it is to marinate / give it flavour! This "blt" is the healthiest blt I've seen! It's a pretty awesome sandwich! I adore tempeh bacon! I just developed a split pea soup topped with tempeh bacon, and its delicious smokiness makes the soup so much more satisfying!